I should be clear right off the bat. Layer cakes are not my forte. Not at all. But this cake turned out beautifully. Baking the cakes in three layers (rather than trying to cut cake layers in half) makes things SO much easier. I highly recommend getting a third cake pan if you don’t have one. 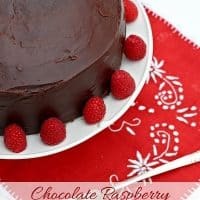 Using a kicked up cake mix also adds to the simplicity. If you prefer, you can strain the seeds from your raspberry puree (which I would probably do if it was going on the outside of the cake) but you hardly notice them in between the layers of chocolate. With a dollop of whipped cream and some fresh raspberries for garnish, this is the perfect dessert for Valentine’s day. To make the cake, preheat oven to 325 degrees. Grease and flour three 9-inch round cake pans (or use Baker' s Joyspray). Beat together the cake mix, eggs, melted butter and milk. Divide batter evenly between the three prepared pans. Bake for 30-35 minutes until tester inserted in center comes out clean. Cool on wire racks to room temperature. Carefully remove the cakes from their pans by running a knife around the edges and inverting the layers onto racks to continue cooling completely. Meanwhile, puree the thawed raspberries in food processor or blender. Heat the puree in a small pot over with the sugar and cornstarch until the mixture boils and thickens. Cool completely. To make the ganache frosting, combine the cream, sugar and corn syrup. Bring to a boil over medium-low heat, whisking until the sugar is dissolved. Place one layer of cake onto a serving plate or platter. 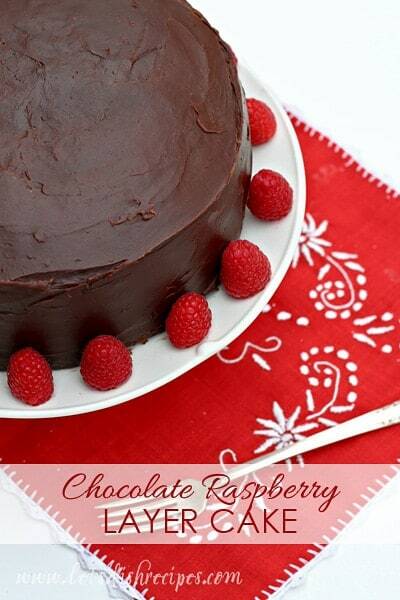 Spread 1/2 of the raspberry puree over the cake to within 1/4 inch of the edge. Top with a second layer of cake and add the remaining raspberry puree. Top with the final layer of cake. Spread the ganache frosting over the top and sides of the cake, smoothing as needed. Keep cake covered and chilled for up to three days. Bring to room temperature before serving. I agree about splitting layers–such a pain. Three cake pans is the way to go. This looks delicious.